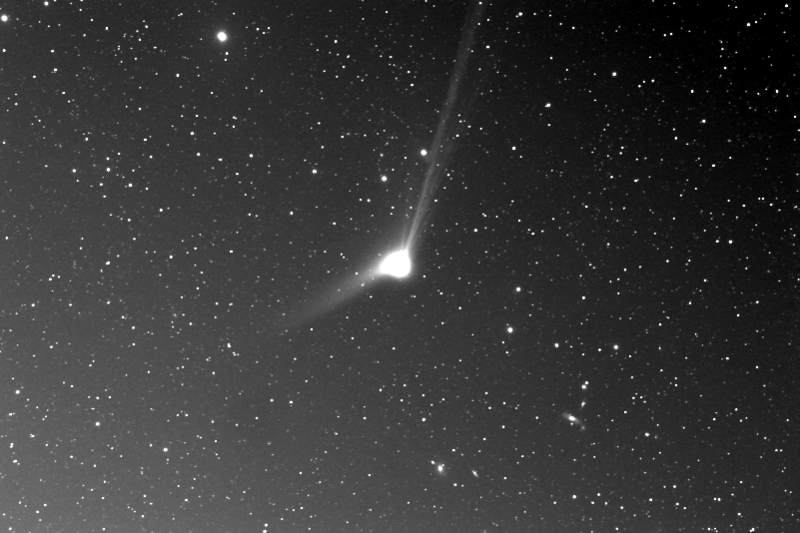 Comet C/2103 US10 imaged with iTelescope T20 on 20 December 2015. MEDIAN stack of 5x180 second luminance images, stacked in ImageJ. Click to embiggen to see the galaxies in the bottom right clearly. 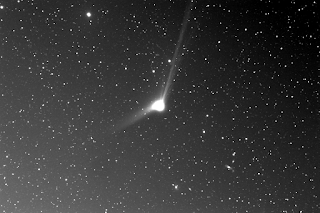 Comet C/2103 US10 imaged with iTelescope T20 on 31 December 2015. MEDIAN stack of 5x180 second luminance images, stacked in ImageJ. Click to embiggen. The ginormous blob off to the right is the bright star Arcturus, making detail in the comet hard to see.. 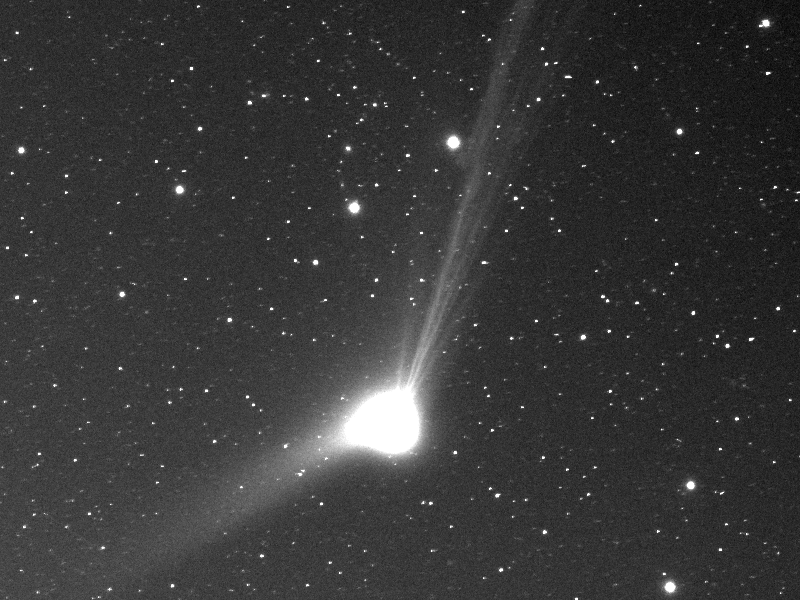 The image of Comet C/2103 US10 above cropped to show detail in the inner tail. Click to embiggen to see the fine structure more clearly. Animation of each of the 5x180 second frames. I have been having extraordinary trouble seeing the bright(ish) comet C/2013 US10 Catalina (magnitude 6.4, just below unaided eye visibility), here in Australia it is very low on the horizon and clouds (and the occasional need for sleep) have frustrated me. My choice of timing for remote telescope runs has been pretty dismal too, I seem to pick all the stormy nights. 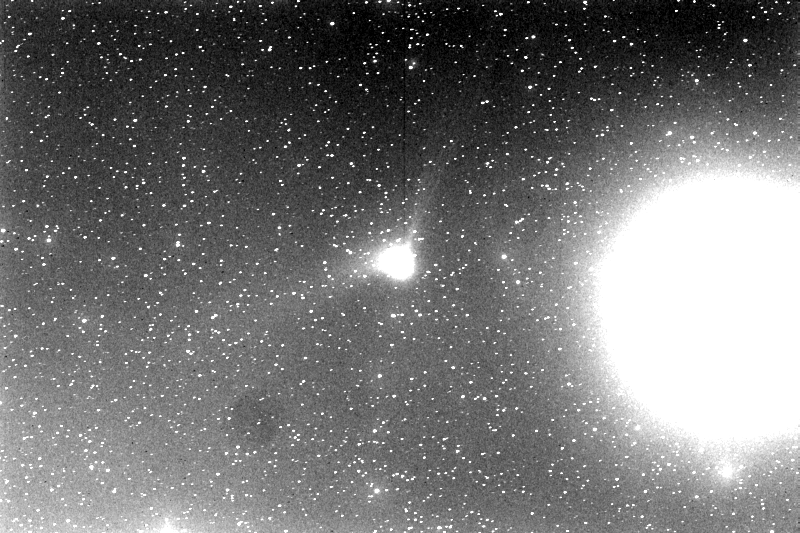 However I have managed to get these two images, one from the 20th showing exquisite detail in the tail, and one from the 31st, when the comet was close to Arcturus. This was interesting but drowned any detail in the comet out. The comet is still reasonably close to Arcturus, if you want to try an find it with your own scopes. In the animation, I see about 15 dots moving at a different speed to the background celestial sphere, are these satellites? Ohhh, thanks Ian. Not used to seeing hot pixels in luminance pics, just my own rgb ones, which look different, haha. Nice detail in the tail, well done!